Chamonix is synonymous with skiing, the home of freeride, après ski and overall, one of the best dang places ever. Does that sound bias? Perhaps, but we love Chamonix for the fact you can take a flight to Geneva, with a short transfer, arrive in resort and enjoy your weekend/mini-break stress-free. So we thought we would map out the ultimate weekend in Chamonix, a 48-hour stint in this winter wonderland. This plan works from December to May, mid-winter skiing or spring skiing, 48 hours in Chamonix is the perfect mini vacay. Let’s start off with the operational stuff, the accommodation. That way you have your base sorted and we can work up. We have essentially made ourselves part of your trip, planning this adventure together! Hip Chalets is without a doubt our first choice. They are the local experts, founded by Jamie and Julia Strachen over 22 years ago. There is nothing about hosting ski-hungry guests these two don’t know about. When it comes to luxury, refinement in a friendly and approachable atmosphere, Hip Chalets is the place to be. Plus, after hectic days exploring Cham, you’ll want a relaxing and calming environment to rest. We can paint you a little word picture. You wake up and in the infamous words of Elbow “throw those curtains wide” and soak up the mountains. After a hearty breakfast, head on over to the lift base and meet up with Cammy Gunn your local instructor and guide. Whether it’s your first ski trip of the year, or maybe you just want to get your ski legs back, Cammy will take you on a mini-tour to get to know the slopes and brush up on some basic techniques. Refine your skill set and by the end of a 3-hour session, Cammy will have you feeling like a Norwegian – having literally been born with skis attached to your feet. If it’s your first day back on the slopes in a while, you don’t want to stop for too long and seize up. Opt for a casual lunch at Chalet La Flégère for a delicious wrap or on-the-go food. Be sure to stay for long enough to enjoy a classic hot chocolate before you head out again re-energised. Considering you’re only in town for a few days, you’ll have to cram as much fun into 48 hours as possible. Hence why you might decide to give paragliding a go? Don’t question it, just go with it. Head to the Alpine Flying Centre and hook up with their experts who can take you through the whole process. The opportunity to fly over Mont Blanc…seriousy this is worth it. Heart racing, adrenaline pumping, what better way to finish off a day skiing than with some après? You’ll need a stiff drink to even contemplate what you just did so head to Monkey Bar Chamonix for live music, excellent atmosphere, and a few expertly mixed cocktails. Once you’re feeling warm and fuzzy inside, you’ll be blending in with the locals seamlessly. Don’t even worry about going home and changing for dinner. Just saunter right on over to the Micro Brasserie De Chamonix for a casual dinner – ski boots ‘n all. MBChamonix was founded in 2002 by beer lovers who were looking for that perfect brew after a day in the fresh mountain air. 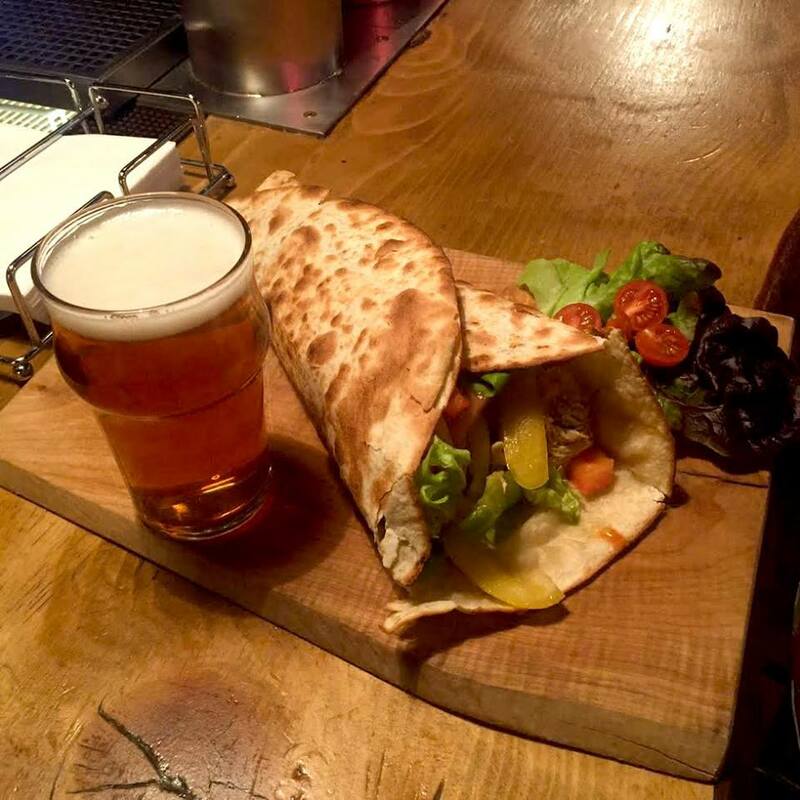 They brew beer on site and serve hearty, healthy and down to earth cuisine alongside it. The perfect fuel after a long day of activity. After that, a good sleep back at Hip Chalet will be well needed. Ready to do it again? Stock up on breakfast, really fill your boots with a heady mix of classic English and continental until you feel a little judge-y of yourself, that’s when you know you are ready for a morning on the slopes. Want to find out what all this off-piste fuss is about? Cammy can take you on an off-piste taster session. He knows the area super well and will show you some secret spots, help you build your technique off-piste, and most importantly make sure you stay safe out there. Opt for a more sophisticated lunch today at SERAC: Restaurants et Bars d’Altitude. They serve French classics, tons of cheese dishes and overall deliciousness. Plus you’ll have earnt a glass or two of local French wine too to match the gastronomical delights. You cannot end your weekend in Cham without taking in the INCREDIBLE views from the Aiguille Du Midi. Head up the cable car to take in the stunning views, and of course, snap an Insta-worthy shot. You may even attach the picture to your out of office reply and really rub it in. We think so. Opt for a fancier après ski to follow on from your day of culture and refinement, you have also started to drink with your pinky out now too. Even if that drink is a jaeger bomb because you are classy. That’s why there is no better spot than Chamonix Social Club. Live music, extensive wine selection, and cocktails. . . Perfect! Wrap up your chic day (and maybe change before dinner this time) and head on over to La Cabane. Try and focus on excellent food, as tough as it is given the views but its worth it for the entire experience. Based on local ingredients and flavours, its a journey through the valley. If you manage to cram it all into your weekend in Chamonix, well you’ve used your time well and hopefully feel satisfied! You might be a little bamboozled about how much you did in such a short time, no doubt you will be exhausted and need a holiday from your holiday. Although 2 days is just a short time to ski in Chamonix, you can certainly enjoy this fantastic ski resort and be ready to come back again. If you want the expert local knowledge and instruction from our Chamonix team on your quick trip, book a 3-hour or all-day private lesson. This article was written with our friends at Ridestore Mag. Head to their website to read more.